On April 6, 2015, NASA's MAVEN spacecraft, shown in an artist's conceptual illustration, reached the milestone of 1,000 orbits around the red planet. NASA's Mars-studying MAVEN spacecraft notched a spaceflight milestone this week — its 1,000th orbit of the Red Planet. MAVEN (short for Mars Atmosphere and Volatile Evolution) arrived at the Red Planet in September 2014 and began its yearlong study of the Martian atmosphere on Nov. 16. The 1,000th orbit was completed on Monday (April 6), NASA officials said. "The spacecraft and instruments continue to work well, and we're building up a picture of the structure and composition of the upper atmosphere, of the processes that control its behavior and of how loss of gas to space occurs," MAVEN principal investigator Bruce Jakosky, from the University of Colorado's Laboratory for Atmospheric and Space Physics in Boulder, said in a statement. Today, Mars is a cold, dry world with an atmosphere just 1 percent as dense as that of Earth at sea level. But things were very different in the ancient past; billions of years ago, rivers flowed and oceans sloshed on the surface of the Red Planet, and its air must have been much thicker. Researchers hope MAVEN's work helps them understand how, and how quickly, Mars lost most of its atmosphere. This information, in turn, could bring the Red Planet's dramatic climate shift into much clearer focus. MAVEN has returned some interesting results in the early stages of its science mission. Last month, for example, mission scientists announced that the probe had spotted auroral displays that penetrated surprisingly deeply into the Martian atmosphere. MAVEN also discovered a mysterious, wispy dust cloud that extends from about 93 miles (150 kilometers) above the Red Planet's surface up to an altitude of 190 miles (300 km). 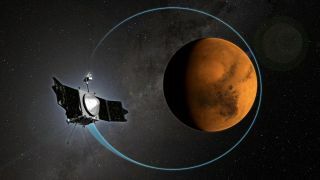 "MAVEN is already producing wonderful science results," MAVEN project manager Rich Burns, of NASA's Goddard Space Flight Center in Greenbelt, Maryland, said in the same statement. "We are all eager to see what this mission has to teach us about the Martian atmosphere past and present." The probe zooms around Mars in a highly elliptical orbit that takes MAVEN as close as 81 miles (130 km) to Mars, and as far away as 4,039 miles (6,500 km).